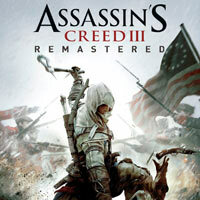 A remastered version of Assassin's Creed III, enriched with all DLCs. The production runs in 4K resolution (on PC, PlayStation 4 Pro, and Xbox One X) and employs the HDR technology. Assassin's Creed III Remastered is a remastered version of the fifth (contrary to what the title suggests) installment of the Assassin's Creed cycle. Just like the original, this open world action game was developed and published by Ubisoft. Action game Assassin's Creed III Remastered takes place in North America in 1753-1783. The main protagonist is the Metis named Connor, the son of Indian Kaniehti:io and British Haytham Kenway. The action takes place at the moment when the village of the protagonist is attacked; it is then that our protagonist decides to devote his life to fighting tyranny and seeking justice. In the following years, Connor took part in the War of American Independence, witnessing events such as Paul Revere's night rally, the great fire in New York and the siege of Boston by George Washington's troops. As in the previous parts of the series, the game also features the modern thread. Players watch the fate of Desmond Miles, who, together with other members of the Assassin Brotherhood, finds an ancient temple located in the state of New York. In Assassin's Creed III Remastered the action is shown from the third person perspective (TPP). The creators provide us with a vast, open world including both the wild areas called the Borderland, as well as the cities of New York and Boston. What is interesting, we visit them in different seasons of the year, which has an impact on the game; for example, snowdrifts make it difficult to move in the wilderness. There are also spectacular sea battles fought on board the upgradeable ship called Aquila. Unlike Assassin's Creed IV: Black Flag or Assassin's Creed Odyssey, in which we fought with other ships during free navigation, here the naval battles have the form of separate missions. During the game we perform fictional and side tasks and undertake a variety of activities such as optional hunting for wild animals, whose skins and furs can be exchanged for more useful goods. An important role is also played by clashes with opponents, which we eliminate in close combat (using weapons such as a tomahawk) or by surprise. Connor can climb not only on buildings, but also rocks and trees, moving smoothly between branches. Compared to the original Assassin's Creed III, Remastered's graphics have been improved. The production works in the 4K resolution (on personal computers, PlayStation 4 and Xbox One X) and uses HDR technology. In addition, it has been enriched with all add-ons developed with the original in mind.